When you're carving this year's Halloween Jack-o'-lantern, you can save the seeds to grow for next year. 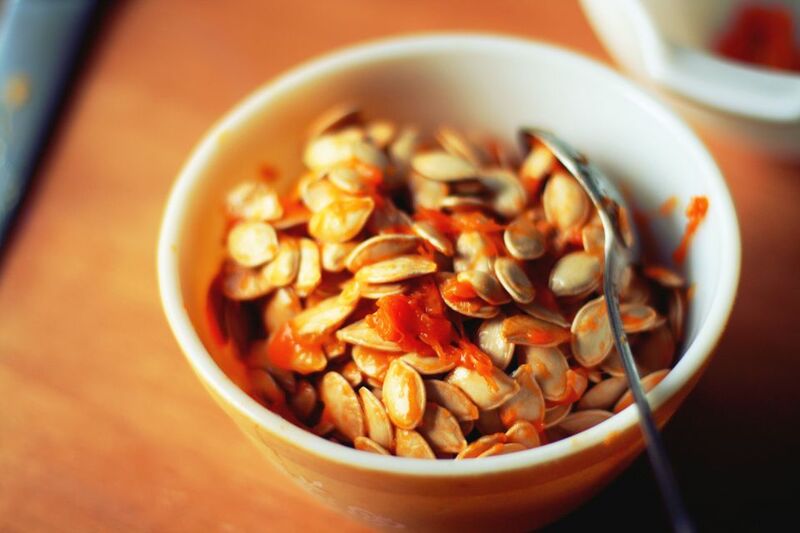 Pumpkin seeds are easy to save, in part because they are large and easy to harvest. For the best results when you grow them next year, first determine whether your pumpkin is a hybrid. If it is, it won't breed true from seeds. That big, orange pumpkin may produce seeds that give smaller, less colorful progeny. If you planted heirloom or open-pollinated seeds, they are more likely to give you the same results. If you are buying a pumpkin at a farm or farmers market, ask the farmer whether or not the pumpkins are hybrids. For a store-bought pumpkin, you are taking potluck. Even with seeds from your homegrown heirloom pumpkins, you may see cross-pollination between pumpkins and squash, such as zucchini. To enhance your chances of getting true-breeding seeds, save seeds from three or more of your best pumpkins. Time Required: 30 minutes or less, then three weeks to dry. Cut your pumpkin open, and scoop all of the seeds into a colander. Run the colander under cold water to separate the pulp from the seeds. Clean any clinging pulp from the seeds. You don't want any pulp remaining as it will prevent drying and can lead to mold growth, rotting the seeds. Line a cookie sheet with paper towels or waxed paper. Some people prefer waxed paper, so the sticky seeds don't end up stuck to the paper towel. Once all of the pumpkin seeds are clean, place them on the lined cookie sheet in a single layer. Separate the seeds from each other, you don't want them in clumps or touching. This will help them dry thoroughly on all sides. Place the sheet in a cool, dry place. For the first couple of days, stir them often and turn them over, so they dry on each side. Continue to allow them to dry for three to four weeks. If you see any mold, discard the ones that are moldy. But this is also a sign that your cool, dry place isn't cool and dry enough. Once your seeds are thoroughly dry, place them in an envelope or brown paper bag. Label it with the date and details about the pumpkin. Store your seed envelope in a cool, dry place until planting time. Some people keep them in the refrigerator if they don't have another suitable place. For the best results, save seeds from heirloom pumpkins. This will ensure that you end up with pumpkins that look like the one you started with.